↑ "Population in the settlements. Svalbard". Statistics Norway. 22 October 2009. Archived from the original on 28 July 2011. Retrieved 24 March 2010. ↑ "The .bv and .sj top level domains". Norid. Retrieved 24 March 2010. ↑ S.L, Tutiempo Network. "Climate Svalbard Lufthavn - Climate data (10080)". www.tutiempo.net. ↑ Marshall,ClimateWire, Christa. "Fast-Warming Arctic Proves Deadly to Animals and People". Scientific American. ↑ S.L, Tutiempo Network. "Climate Svalbard Lufthavn (July 2015) - Climate data (10080)". www.tutiempo.net. ↑ 9.0 9.1 "Sunshine & Daylight Hours in Isfjord Radio, Svalbard, Norway Sunlight, Cloud & Day length". www.svalbard.climatemps.com. ↑ Sjöblom, Anna. "Weather Conditions on Svalbard" (PDF). Retrieved June 13, 2015. 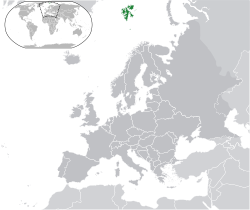 Wikimedia Commons has media related to Svalbard.